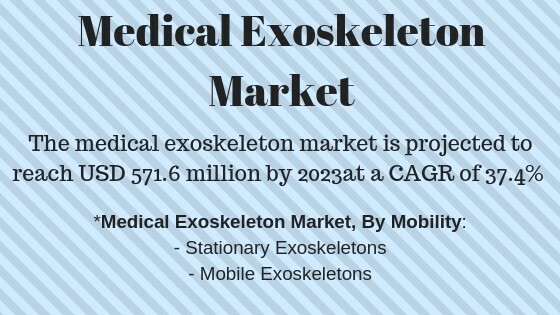 The global medical exoskeleton market is projected to reach USD 571.6 million by 2023 from USD 116.7 million in 2018, at a CAGR of 37.4%. The Market Research on Medical Exoskeleton Market, By Considering useful aspects like; component, type- Global Future Forecast till 2023, published by MarketsandMarkets™, the report studies the global Medical Exoskeleton market over the forecast period to 2023. The medical exoskeleton market is segmented based on component, into hardware and software. The hardware segment is estimated to account for the largest market share in 2018. The large share of this segment can be attributed to the fact that many parts such as sensors, actuators, power sources, and control systems are required to manufacture exoskeletons. Manufacturers are also adding upgraded and advanced hardware into the overall design to enhance the capability of medical exoskeletons, making them smarter and more interactive.